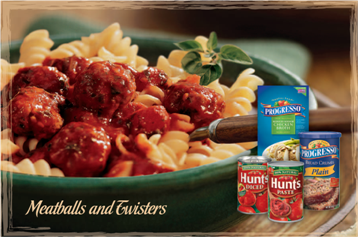 Progress, Muir Glen, Hunts, and Green Giant are the perfect combination for preparing an easy, fast, and yummy Italian dinner. What makes this combo additionally superior is Italian Days at Publix. Yep, time for another round of Italian Days Recipes and free groceries! Italian Days at Publix means great prices and coupon savings on some of my favorite brands including Progresso, Green Giant, and Hunts to name just a few. Being a member of General Mills ClickCallMail.com since the last Italian Days has kept me informed on the latest General Mills promotions happening at Publix. Therefore, I was ahead of schedule when myblogspark offered this promotion. Nice one huh? In addition to the fantastic savings and amazing flavors of Italian Days at Publix, from February 16th – 29th you can enter the Taste the Tradition Italian Days Sweepstakes. Also sponsored by General Mills the official rules state, “One hundred and twenty-five (125) potential winners will be selected on or about April 14, 2012 from each of the Publix divisions (Atlanta, GA, Lakeland, FL, Jacksonville, FL, and Miami, FL) for a total of five hundred (500) winners.” Therefore, Italian Days at Publix not only indicates savings and flavor but also winning! An economical and easy winning recipe is my shortcut Pasta e Fagioli. (Pronounced Pasta Fah-zool where I grew up) My son learned to prepare this pasta dish and I can tell you unequivocally, it has become a college favorite! In addition to the flexibility and easy preparation, just a few dollars will feed many. Cook pasta al dente according to package directions. Rinse and drain well. Meanwhile, sauté diced onion until soft. Add the baked beans and half the spaghetti sauce. Simmer about five minutes to meld flavors. Return pasta to the original pot, add enough water to barely cover the pasta and set the burner to low. Pour the spaghetti sauce mixture into the pasta and stir. Cook just until heated trough otherwise pasta will become too soft. Add additional sauce to achieve desired consistency if needed, then salt, and pepper and taste. Top with parmesan cheese and serve. This is another easy yet impressive Italian Pasta recipe. A complete meal that comes together in about 30 minutes, it is a great way to deliver those veggies with real Italian flavor. Cook pasta according to package directions. Meanwhile, cook vegetables according to package directions in the microwave. Next sauté the onion in butter until translucent in a four-quart stockpot. Add the vegetables and the Alfredo sauce to the pot. Simmer on low to heat and meld flavors. Add the cooked pasta to the sauce and stir to blend. Add enough milk to achieve a creamy consistency. Toss to heat, plate, and top with grated Romano cheese and a hunk of Publix Italian Bread. This Alfredo pasta dish can easily be prepared using whatever veggies and/or cut of pasta available. 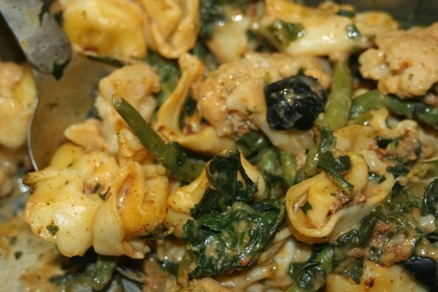 I have adapted this recipe oodles of times – added crushed red pepper flakes, used light cream instead of milk, included shrimp or hot Italian sausage, and even torn baby spinach for a Florentine style Alfredo Primavera. Enter to win a $25 Publix gift card here on A Midlife Woman by sharing your favorite Italian dish with us! Simple entry requirement, am I right? One winner will be selected on Monday, President’s Day via Random.org. Good luck! my favorite italian would have to be chicken marsala! I love it! My favorite Italian dish is Chicken Fettucine Alfredo. My favorite italian dish is spagetti with garlic bread. My favorite Italian dish is lasagna! and the kids love spaghetti. Thanks for the giveaway! My favorite is lasagna made with vegetables in the sauce. i love Publix. tweeted: https://twitter.com/#!/maryjaco1/status/171445122578395136 I hope I am selected. I love their sales. We love Publix! My favorite Italian dish is ravioli. I want to try this kind of food..Sounds delicious and healthy kind of food..thanks for sharing the recipe..Hope you can share more delicious recipe..